Dar-Tus is a family-run guesthouse and can be found in the heart of the old medina of Tangiers (in the area known as Dar Baroud). 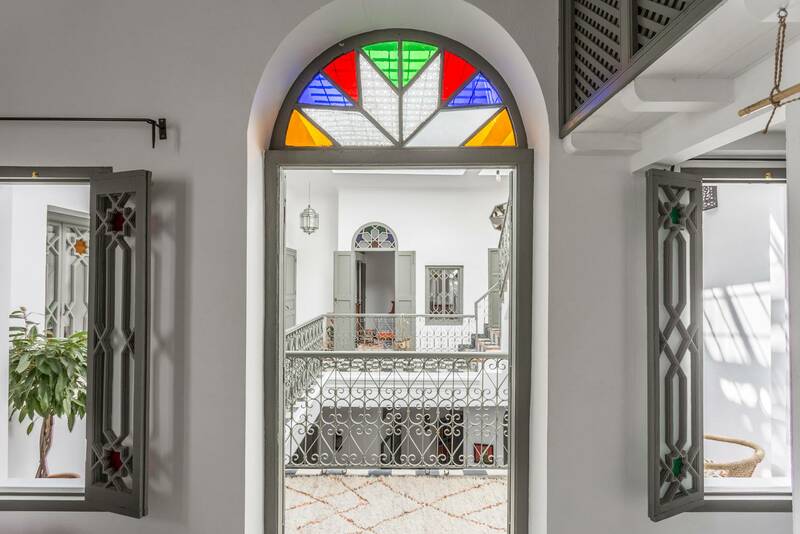 It is a traditional riad, which has been completely and lovingly restored and renovated by Marie and Christophe. Dar-Tus has five bedrooms and can host up to 13 people. Our guesthouse has been especially adapted to welcome families: It really is a unique and magical place, with its large living and dining area, children’s space, patio and beautiful terraces that have a spectacular view over the Straits of Gibraltar. You can find a number of paintings from local artists on the walls; and books available in the guesthouse library, adding to its creative and artistic charm. Marie and Christophe have lived with their three sons in Tangiers since January 2005. Christophe is a journalist for a local French-Moroccan radio station and Marie is a designer. She has set up a workshop in the Kasbah area where she creates clothes and household linens. Having fallen in love with Morocco and, above all, this area, they relish in discovering the charms of the place: meandering through the medina and the Tangiers treasures are hardly a secret to them anymore.